Barr’s Bay Park lies on the edge of Hamilton Harbour and is a great place to come to relax after shopping in Hamilton. The park is quite small but offers manicured lawns, palm trees, and some benches where you can sit and watch the boats docked at the Royal Bermuda Yacht Club’s marina. 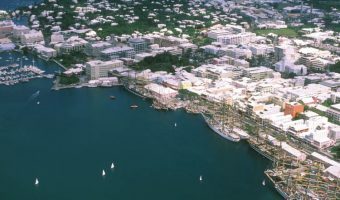 The site of the park was the setting for one of the most significant events in Bermuda’s history. In February 1835 the Enterprise, an American slave ship, was driven off course by a hurricane while en route from Virginia to South Carolina. She was forced to head to Bermuda for supplies. Slavery had been abolished in Bermuda and throughout the British Empire the previous year. On discovering that the ship had a human cargo of 78 slaves the Bermuda authorities refused the Enterprise permission to continue her journey. Word of the slaves spread throughout the island and the Young Men’s Friendly Lodge obtained writ of Habeas Corpus from the court. It ordered that the captain bring the slaves before the Chief Justice and they answer individually whether they wished to continue to South Carolina or be freed and take up residence in Bermuda. The slaves were brought ashore at what is now Barr’s Bay Park and were welcomed by a large crowd. At the court all but six, one woman and her children, decided to remain in Bermuda. In 2010 We Arrive, a bronze sculpture by local artist Chesley Trott, was unveiled in Barr’s Bay Park to commemorate the event. It is one of the points of interest on the island’s African Diaspora Heritage Trail. In the summer months the park is the venue for concerts and outdoor events, including the Department of Tourism’s Bermuda Nights. Barr’s Bay Park is easy to find. It’s on Hamilton’s waterfront, just a couple of hundred yards west of Hamilton Ferry Terminal and a 10 minute walk from the bus station. Like all public parks in Bermuda it’s open from sunrise to sunset. Map showing location of Barr’s Bay Park. FYI The 2014 Newport Bermuda Race post-race celebrations will be held here on June 27.